2009 offers a major challenge for Red Bull and its head of design Adrian Newey. The famous designer is known to excel in difficult situations such as a major shift of regulations. When he was at Williams, the cars were aerodynamic masterpieces, while at McLaren the competition was simply blown away as the team handled the reduced thread width much better. This time around it's no different as the rules have changed more than they ever did in Newey's Formula One career. Part of this excellence is found in the rear suspension, which re-introduces the pull rod, contrary to all other teams' designs. This particular design choice allowed for the rear suspension components to be located low to the car's floor and to have the lowest sidepod rear end of all 2009 cars. To benefit from this sloped airflow, the rear wing endplates are also extended down to the car's floor, taking part in the diffuser's downforce generation. The front end of the car is equally different from the competition. It features high edges on each side of the nose cone to structurally strengthen the front end while at the same time keep airflow under control under yaw. The underside of the nose is rounded, allowing for the lower wishbones of the front suspension to be as long as possible with obvious benefits for the suspension geometry. The front wing focuses on high downforce generation just ahead of the front wheels. The steep moveable flaps create downforce on the wing's outer parts. The neutral central part on the other hand attempts to stabilise airflow in between the front wheels. Adrian Newey, Chief Technology Officer: "The idea is that the centre of the front wing is most susceptible to disturbance and this solution makes the centre very neutral, while the tips of the wide span wing are heavily loaded with this design. The lack of appendages such as winglets, barge boards and so on causes a loss of downforce, but they don’t affect the fundamental behaviour of the car. However, the behaviour will be different, because of the front wing and the diffuser, which is now moved further back and is higher. Being alongside the rear wheels, instead of in front of them, it now works in a different way. The rear wing is narrower and higher, the aim being to reduce its effect on a following car. It’s a bit like a mushroom cloud, in that the narrower and taller you make it, the less effect it has behind it." The engine side is however less interesting due to the compulsory freeze on engine development. The year however marks the third year of Red Bull Racing’s partnership with Renault. A new limit on the number of engines per season, a lower rev limit, the complication of KERS and different aero and bodywork parameters, all of these considerations have to be taken into account. Fabrice Lom, Renault F1’s Technical Coordinator explained: "We have eight engines per driver to last through all 17 grands prix, including Friday practice, so penalties are only incurred once any driver uses a ninth engine. On average, therefore, an engine has to last around three grands prix plus the equivalent of one extra grand prix to cover Friday’s free practice sessions. However, there is no stipulation that the engine used on a Friday must then be used for the remaining two days, so one can juggle the engines around within the eight engine limit." "We will see a significant drop in power from all the engines on the grid, because of the rev limit being lowered from 19,000 to 18,000rpm. As the engines were designed to run at 19,000rpm, we had our work cut out to ensure they worked as effectively as possible with a thousand fewer revs per minute." "We are allowed to make modifications to the engine aimed at incorporating the arrival of KERS as this system changes the areas on the engine which are subject to vibrational stresses. We have carried out modifications allowed within the rules to guard against an engine breaking, simply because the car uses a KERS system. The usable rev range of the engine also needs to be different to adapt to KERS, to cope with the fact that inevitably, gear ratios will be too long for the power on offer from the engine when the energy stored by KERS is not being released. The system impacts on the engine in that it affects its driveability, but operationally at the racetrack, the management of the Renault-developed KERS is entirely in the hands of Red Bull Racing." The introduction of slick tyres did pose an interesting study for the development team. It created a "substantial mismatch" with the front tyres too strong for the rears. Hence the weight distribution had to be moved forward quite a bit to preserve the rear tyres from wearing off too quickly. Finally there is the KERS system. 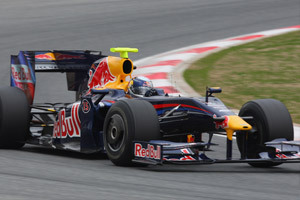 Red Bull opted not to run a KERS testing device in an interim car but instead waited for the '09 car. Then after some factory problems with its own development, Red Bull decided to work with Renault on the system to keep costs under control. Geoffrey Willis, Technical Director: "While there have been some safety concerns in early testing by a few teams, fundamentally safe operation is dependent on good design and proper procedures. F1 has learned to deal safely with a lot of potentially dangerous systems – this is just a new technology to learn to deal with. The additional challenges for KERS are to minimise the detrimental effects to chassis performance resulting from the additional weight, compromised braking stability and increased cooling requirements. The teams will judge where and when to use KERS by balancing these chassis performance penalties with the obvious gains."